For most people, using a rice cooker is a child’s play. However, if you want to make excellent rice and not just plain rice, you will have to learn using a rice cooker properly! Here are some tips and tricks. The function of rice cookers is to boil the rice and keep an eye on temperature. Once all the water has boiled away, temperature begins rising which indicates that rice is done and it’s time to shut the heat off. Thus, the time to shut off depends on the amount of water you add to the cooker. If the water is not enough, the rice will be underdone and if it’s in excess, the rice will be overdone. So, it’s important to add just the right amount of water. Roughly, for most rice cookers, for 1 cup rice, 1 cup of water should be added, i.e. in equal parts. For rice less than 1 cup a slightly more amount of water than equal is often desirable. Also, for completely dry rice, you have to add a little more water than equal. Some water will also be added when you rinse the rice. All these factors have to be considered while adding water to the rice. After some trial and error, you can find the correct ratio. Rice should be thoroughly washed before putting in the cooker. Take it in a large container (if it has perforations smaller than the size of rice, it’s better) and add water and squeeze rice. If the container doesn’t have perforations, the accumulated water will become cloudy. Pour it out and repeat until you get fairly clean water. Drain the rice after rinsing as nicely as you can. In the past, rice used to be dusted with a talc to prevent them from sticking together and the purpose of rinsing was to rinse this talc which was not particularly tasty. However, today, an anti-caking agent which is starch-based is used for the purpose and it’s perfectly edible and tastes much like rice itself. So, according to many people, rinsing is unnecessary. However, rinsing has another purpose too and it’s making the rice better because the anti-caking agent absorbs water and doesn’t allow it to reach the rice grain. By washing it off, the rice is cooked better. After you shut off the flame, your rice cooker will go in a “warming mode”. However, this is not the time to dig in immediately as you may think. To let the cooking process fully complete, it’s better to wait for 5 or rather 10 minutes during which you should not open your rice cooker. The wait is actually worthwhile. 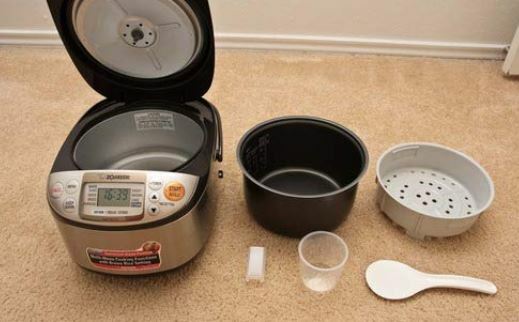 Follow these tips and you will realize that using your rice cooker is not a no-brainer and it needs some tactics. And with these tactics, you can make the most of it and enjoy your rice!